Mal has been excited for Halloween for weeks. He's been asking if we can go to Halloween and we've had to stop and see every single decoration at every house on our walk to and from preschool. Neighbors across the street had several skeletons out and we had to say hi to them daily. Sometimes he'd update me on the skeletons' moods through the day. He loved all the spiders and pumpkins. He was simultaneously terrified and fascinated by "creepy things". He watched the Curious George Halloween movie over and over until he fell in love with "punkin Chismas" (The Nightmare Before Christmas) and has only wanted to watch that since. The kids were very excited to open the package and have something Halloweeny around the house. And for the jars of candy she sent as well. 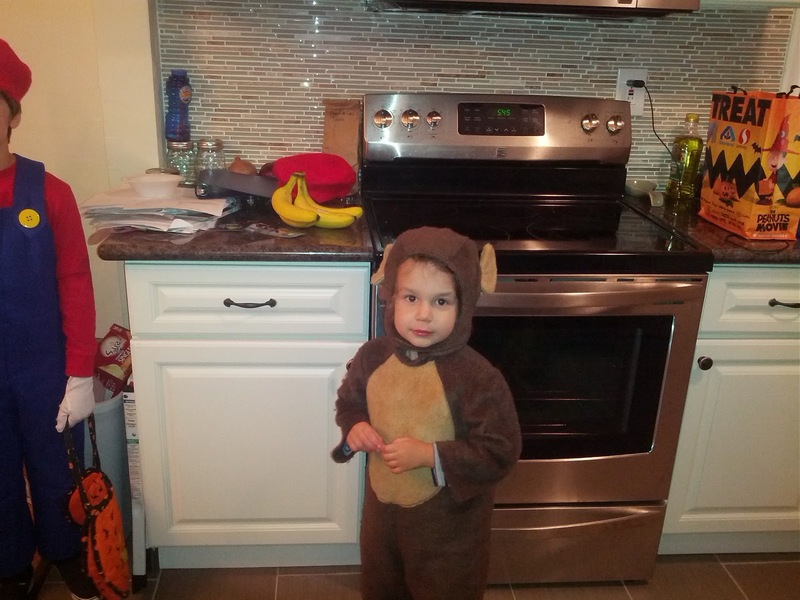 Mal kept saying "Happy Halloween" over and over and over. You had to respond in kind or he'd get more insistent and desperate in his tone. Then he'd let it be for a few minutes until he felt it was time to start the process all over again. For costumes the kids went easy on me this year. Gareth couldn't think of a costume idea except for Mario (seriously?! I could think of several, but wanted his costume to be his idea and didn't want to suggest something I wasn't sure I could deliver). Plus, reusing Mario would be easy. His Mario costume from two years ago just barely fit still, Mal was due to wear the Joker costume. 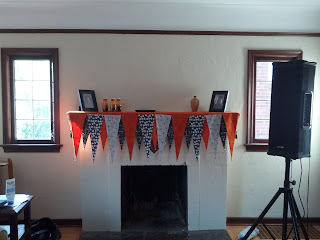 We did our best to prep him for the makeup, showing him video and pictures of Gareth in the costume. He seemed excited, but come Halloween we only got as far as brushing his hair. As soon as Ryan showed him the face paint he freaked out. 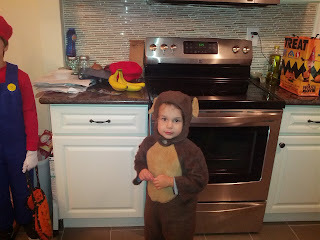 So we pulled out the monkey costume from last year, which also just barely fit, and he was happy as a clam. The Joker costume was actually a bit large on him, so maybe we'll try again next year. 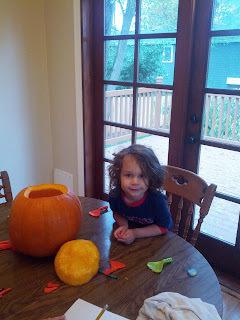 We carved up a pumpkin Halloween afternoon, and Mal was bouncing with excitement. Both boys helped a bit with scooping out the insides, Gareth helped with designing the face, and Mal (with help) helped to cut out some of the face. As you can see, there's a second pumpkin there. Gareth got it on a field trip. 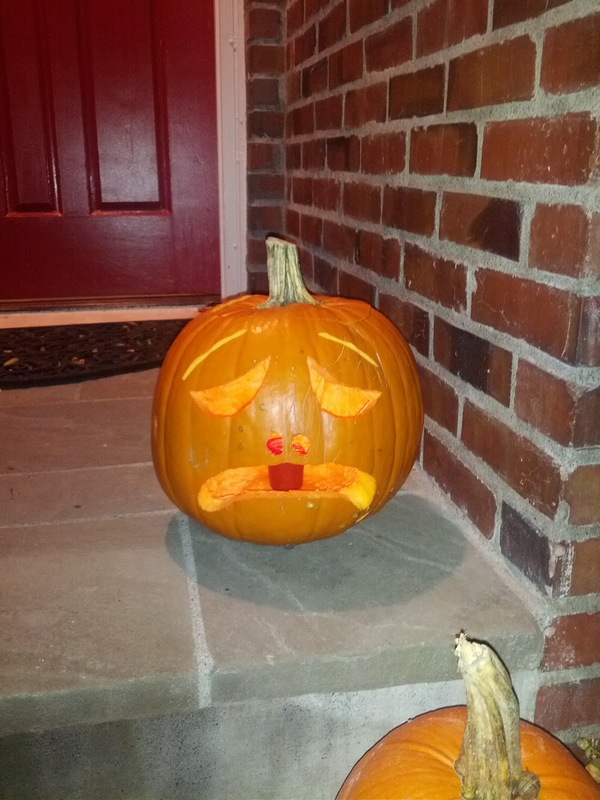 We were all too lazy to carve two pumpkins. Friends from our old neighborhood came over our way to trick or treat. We also invited a new friend to join us. The weather was supposed to be rainy, but it looked like we'd get a mostly dry window around 5-6. So we decided to head out once all our friends came and eat after trick or treating. Ryan and a friend stayed home to man the door and watch Walking Dead. Initially we seemed to be the only ones out. But after one street we started to see a few more people out. 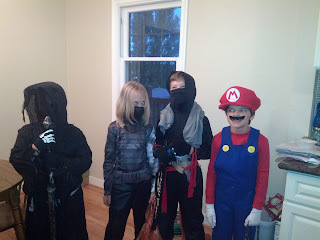 There were quite a lot of houses passing out candy, so once we'd done a few blocks the kids were ready to be done. We headed home and ate smoked gouda mac n cheese and apples (and candy, of course). I'm not sure exactly how many kids came to our door, but we ran out of candy, so next year I'll plan on buying more. We got very few kids at our rental place, which was always disappointing to me. 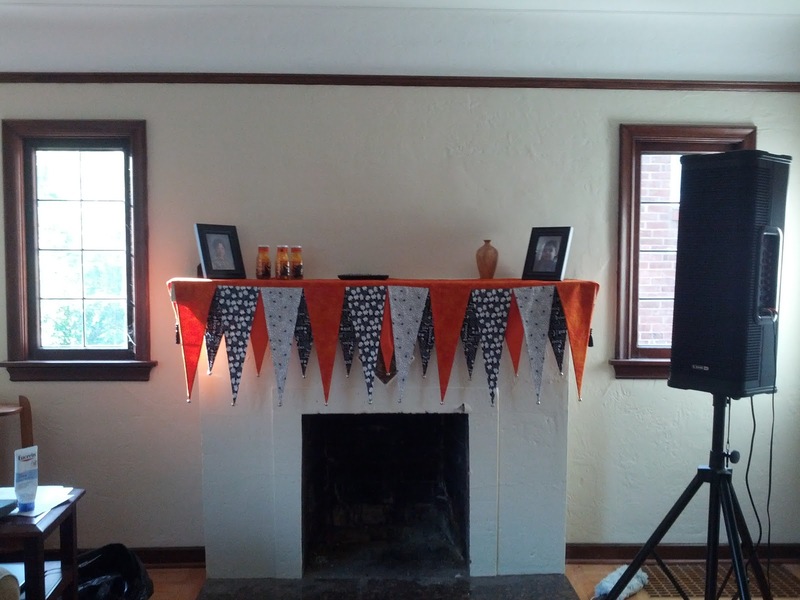 I'm excited that this house will hopefully consistently see more trick-or-treaters. "he'd update me on the skeletons' moods"--totally made me laugh!! What a fun boy!